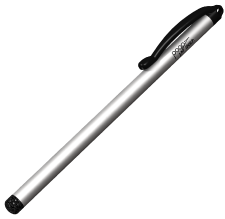 The Pogo Sketch stylus promises to add tablet-like functionality for laptop's multi-touch trackpad (YES, including the Macbook). While it probably isn't the same as a real tablet, it beats drawing crap with your finger. The Pogo Sketch looks pretty similar to previously-released Pogo Stylus for the iPhone (and probably uses the same type of tip), except that it's a little bit bigger. And there's no special tech at play here, except a foam-type tip, so it won't add any professional-level tablet features to your trackpad. It merely provides a way to use a capacitive surface without your finger.